Gone are the days when you had no choice but to spend thousands on a hearing aid. These days there is far more choice on both model and price thanks to the internet. However, some people who want to buy a hearing aid online are being put off doing so because they do not know how to go navigate through what can sometimes be quite a stressful purchase decision. Because of this, we decided to take you through the process of buying a hearing aid online. Why buy hearing aids online? First, let’s explain why we recommend buying a hearing amplifier or aid online. Choice – The main reason is choice. When you buy online, you are not restricted to the one or two brands and models that are available locally. Having more choice increases the chance of your finding the right solution for your particular hearing problem. There are lots to choose from. Also, not only are there hearing aids, there’s also lots of personal hearing amplifiers. These are often cheaper and are well suited for people with mild hearing loss. Price – Shopping online allows you to compare prices and get the best value for money. Naturally, you have to be careful because there are a lot of fake products out there, however, this is the case regardless of where you buy your hearing aid. Fakers sell via shops just as much as they do online. You also need to ensure that you are not scrimping too much on price. You need to ensure that you invest in your hearing – its fine to buy a cheap hearing aid if thats all you need by just be sure to research the pitfalls before hand. Research – Shopping on the web allows you to thoroughly research a product before you buy it. This is vital when you are spending several hundred dollars. You need to know what others thought of the product and to be able to get all of your questions answered. Online you can ask several suppliers the same questions and crosscheck their answers. It is also possible to download and read the manual. None of this is possible if you buy offline. Do you need a recommendation from an audiologist? This is a question that we are asked a lot, and our recommendation is that you always speak to a medical professional about any hearing loss. Whilst it is true that hearing loss happens to most people as they get older, this doesn’t mean that you should put off seeing a qualified professional. You need to do so to rule out serious disease and to make sure that you understand the underlying cause of your hearing loss. This understanding will help you to research hearing aids and find the right one for you. Be sure to ask for a hearing exam or hearing test. An audiogram is a good thing to get done before buying any hearing aid. If your audiologist recommends a particular type of hearing aid, it is a good idea to listen to his or her advice. They stay abreast of new developments and research, so their advice is generally the best you can get. Remember to also ask for a copy of your results. That way you can share those results with other hearing specialists or refer to them when buying a hearing aid or amplifier. However, we do not believe you have to buy your hearing aid via your audiologist. The best approach is to get a full quote from them then, go home and shop around. Now you know why we recommend buying hearing aids we are going to guide you through the research and purchasing process. Once you know what is behind your hearing loss and how your condition is expected to progress you are equipped to buy your own hearing aid. At this point, you can also consider using a telephone based hearing assessment to help you to keep track of your hearing loss. This kind of hearing assessment is easy to use. All you need to do is to ring the number provided or go to the website and follow the instructions. Here is a link to one provider who offers telephone-hearing tests. Please do not use a phone based hearing assessment as a way to get a diagnosis. They only give you an idea of which sounds you have problems hearing. This is because the quality of your phone and how good the connection is will have an impact on the accuracy of the test. It is impossible to do a proper full-blown hearing test remotely, so be wary of any firm that tells you otherwise. Using the results of the various tests, you can now look for the right device for you. You need to understand the kind of hearing loss you are suffering from to narrow down your options. Here are some of the things you need to consider when buying your device. Size – size is an important consideration. However, resist the temptation to buy the smallest device. If it performs well that is OK, but there is no point in buying a tiny device if the spec is not right for you. Also, bear in mind you will need to change the batteries and may need to adjust the volume manually. The smaller the device is the trickier this will be. Comfort – try to find a device that offers you several ear tip options. Most people find changing the tips is enough to solve any discomfort issues. Type of hearing loss – we have already mentioned this, however it is important which is why we are saying it again. Some kinds of hearing loss require you to buy a medical grade hearing device, which is why it is so important to understand your condition before you buy any hearing gadget. Cost – we recommend shopping around, but please do not simply buy the cheapest device. Bear in mind the cost of shipping and make sure that if you do not get on with the device you can get your money back and do so easily. Maintenance cost – the cost of maintenance is also a factor you need to consider. Ask yourself how long the batteries will last. Even rechargeable batteries have a life and batteries cost money. Some hearing aids also have to be serviced every year, which costs too. Life of the device – many people do not realize that hearing aids have a shelf life. They do not last forever, you need to check how long any device you are considering buying will last. 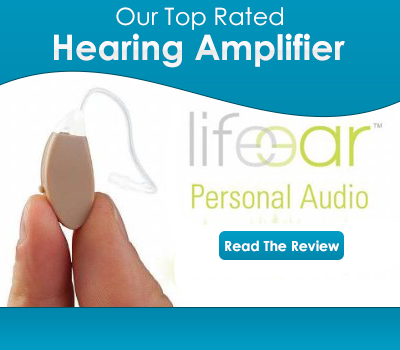 Check the reviews to see what other users say about how long their hearing amplifier lasted. Future adjustments – The last consideration is an important one. Most people find that their hearing loss deteriorates over time. Therefore, we think it is worth considering buying a hearing aid that will allow you to make further adjustments. The first step is to understand your condition. It is also important that you understand how different hearing aids function and what kind of hearing loss each can help with. You can find all of this explained in detail elsewhere on this site. For now here is a quick overview. There are three main types of hearing aid. Analogue, digital and amplifiers. They all enhance hearing but process sound in different ways, so produce different results. Most analogue hearing aids just amplify sound. They amplify all sound including background noise. In noisy places, like restaurants, this kind of hearing aid is not ideal, but they are great for watching TV or holding a conversation at home. Digital hearing aids include a small microchip. They analyse the sound and filter out unnecessary noise. Most people can hear well using this kind of hearing aid even in crowded noisy places. In short, amplifiers or analogue hearing aids enhance all sound including background noise. Digital hearing aids process the sound filtering out unnecessary background noise. There are also bone conductive hearing aids. These are for the profoundly deaf and most require surgery to be fitted. You will not find these specialist hearing aids for sale online. Once you know what type of hearing aid you need, you can begin to shop around. When buying a hearing aid you need to be careful to calculate the true purchase cost. A common mistake is assuming that the price quoted is for a set of hearing aids. Normally this is not the case. Most firms list the price for just one device. Therefore, if you need a hearing aid for each ear you will need to double the price. If you are buying a rechargeable hearing aid make sure the recharging cradle is included in the cost. Most hearing aids include a couple of different earpieces, everyone’s ear is a little different, so check the price includes this or the cost of ordering different shaped or sizes. When buying online, don’t forget to factor in the cost of post and packaging. Credit card charges also need to be considered. Also, check out the returns policy. There may be a money back guarantee, but you are likely to have to pay the postage each way, so it is worth checking. What guarantees do you get when you buy online? You have to be careful to buy your hearing aid from a firm that offers good customer support. If there is no way to contact the seller it is best not to buy from that retailer. Also the best firms offer a full money back guarantee. When researching always make sure the retailers number is prominent, they have their terms and conditions clearly displyed and any returns or warranty information is easily accessible. We recommend that people start their hearing aid shopping on amazon. There are several reasons for this. Reviews – On Amazon, you get the chance to read reviews from people who have actually bought and used the product. This is invaluable information, and something you do not really get elsewhere. It also means that a retailer who tries to sell cheap copies soon get caught out by reviewers. Amazon soon kicks this kind of seller off the site and you get your money back. Value for Money – Time and time again we have found Amazon to be the cheapest place to buy hearing aids. Of course, you should still shop around, but usually you will find Amazon cheaper. Secure Checkout – When you buy from Amazon, you know that your personal details are secure. There are other reasons to buy your hearing aid from Amazon, but these are the most important ones. Am curious regarding wire and box attached to amplifier? The info is very interesting. Thanks for this help on buying hearing aids. It is a daunting task and your analysis is much appreciated. Hearing aids are key to improved hearing amp; provide a better quality of life for those with hearing loss amp; our expert selection starts from ?